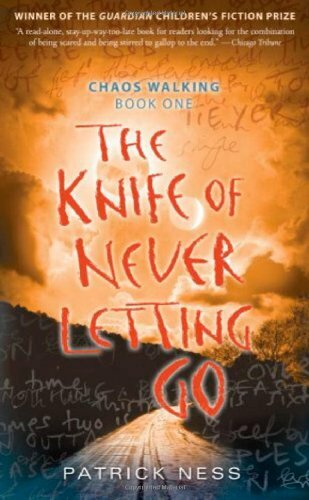 Welcome to the discussion post of Chaos Walking Week! In this post, I'll be asking some questions about the book and hopefully we'll be able to discuss the answers in the comments. 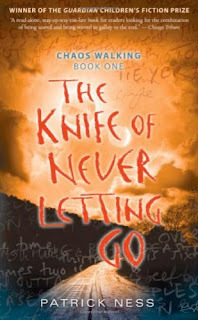 Please do not continue reading this post if you have not read The Knife of Never Letting Go, since this post (and the comments) will contain spoilers. I've never hosted such a discussion post before, even though I've been dying to do one for ages, so bear with me! I've made little 'sections' with a couple of questions, hopefully it makes sense..
- Ness has written the book from Todd's point of view who has a never stopping flow of Noise pooring out. The story resembles that: we experience the streaming of Todd's Noise during a great part of the book. Did this make the story or its characters more significant? - Have you had the same experience in terms of information coming at you in a never ending motion (with social media like Twitter, etc.)? - Does the change of font add anything to the story? - What do you think is Viola's reason not to talk to Todd in the beginning? - Does Todd love Viola? If so, in what way? - Is Todd's relationship with Manchee developing during the story? If so, does it develop in the same way as Todd's character? - Are Manchee's thoughts portrayed in a realistic way? And for other animals? - What do you think becoming a man makes it so significant to Todd? - Why do you think Mayor Prentiss did what he did to the women of Prentisstown? Was it fear of the unknown, or something else entirely? - How significant was Aaron's role to the story? Was he a minor or major influence to the plot? - Did the setting of the book enhance the story? - What did the killing of the Spackle mean to Todd's character? And the storyline? - How important was it that Viola was the one to finally kill Aaron? Personally, I loved the writing style in combination with the setting on a different planet. It made the story very distinct from anything else I've read in YA and it made the characters more unique. At first I thought it would be completely unbelievable, "aliens" who have a constant stream of thoughts that's projected into your head - whut? But I loved the way it was executed. Ness is able to write in such a way that I'm completely sucked into the story, and I love that! When I read TKoNLG, I thought Prentiss was jealous of the women, because they didn't have their thoughts for everyone else to see and hear. I think he was jealous that he had to share, and they didn't and that made him angry and frustrated - even though we don't know the entire story by the end of the book. He came across as a very selfish man to me, and I wouldn't have been surprised if he lost control of his desire to make everyone 'equal' in his disturbing manner. I don't know. As for Aaron - I think he was an illustration on how Prentiss' thoughts have brainwashed some of the men from Prentisstown. He was merely an example of what would happen when Prentiss got his way, and I think that while he contributed to the way Viola and Todd developed in the book and the rest of the series, I think that he played a minor part in the overall plot. That doesn't make him less crazy, though. I just think that he was brainwashed into believing that it was his destiny.